To continue my series covering Broward’s election results for 2014, I’ll show in this graphic the demographic breakdown among Broward County’s registered voters. Hispanics increasingly registering as NPA, now at 24% of all NPA voters; Hispanics have also increased as a percentage of registered Republicans and Democrats. See the graphic below for more details. Richard DeNapoli served as the Chairman of the Republican Party of Broward County from December 2010 through December 2012, as was a delegate to the 2008 and 2012 Republican National Conventions from Broward County. He is an attorney and Certified Financial Planner (R) who now lives in Sarasota County with his family. You can read more about Richard at www.richard-denapoli.com. The recap takeaway: The more Republican “East Side” of Broward County exhibited remarkable uniformity in its voting patterns, showing similar numbers for Representative George Moraitis, Ellyn Bogdanoff, and County Commissioner Chip LaMarca. It also averaged a 51.4% turnout, much higher than the rest of the county. Republican voter performance (i.e., how much Republicans turn out) is key to Republican victories here, and outweighs simple registration numbers. In my first post, I examined the countywide numbers for Governor Scott and Charlie Crist. In this post, I’ll take a look at Northeast Broward, the traditional territory in Broward County where Republicans are competitive. Let’s define this territory generally as that encompassed by State Representative District 93, where Republican George Moraitis is the incumbent and won with 56.7% of the vote in this all-Broward district. These same precincts represent the Broward portion of State Senate District 34, where Democrat Maria Sachs is the incumbent. Former Republican State Senator Ellyn Bogdanoff ran for this seat again in 2014, receiving 55.5% of the vote in the Broward portion of this district, but was unsuccessful because the State Senate district also takes in more Democratic areas in Palm Beach county. Republican County Commissioner Chip LaMarca won in a district that contains some of this area with 52.9% of the vote against Democrat Ken Keechl. REGISTRATION NUMBERS: The Broward portion of Senate District 34, as of the book closing date of the 2014 General election, contains 40,287 Republicans (36.9%), 38,166 Democrats(34.9%), and 30,871 Others(28.2%), for a total of 109,324 registered voters. So, there’s a 2% Republican Registration advantage. County Commission 4 contains 36,833 Republicans (32%), 46,610 Democrats (40.4%), 31,790 Others (27.6%) for a total of 115,233 Registered Voters. So, there’s an 8.4% Democrat registration advantage. UNIFORM VOTING. What’s amazing is how uniform the voters are here. In the Broward portion of State Senate District 34, Ellyn Bogdanoff received 55.5% of the vote. George Moraitis, running in these same precincts for reelection to the State House, received 56.7% of the vote. Most will agree that while Bogdanoff’s race against Maria Sachs involved hundreds of thousands of dollars spent in a very competitive race, Moraitis faced a relatively unknown opponent, Scott Herman. Herman, while loading up his campaign account with over $340,000 in loans to himself, ended up spending just about zero in the final month of the campaign. Bogdanoff had total expenditures of over $700,000 (not including outside ECOs), and Sachs spent almost $300,000 in her direct campaign account (not including Democratic Party and ECO expenditures). So, we can use the Moraitis race as a test case for a noncompetitive race, while Bogdanoff’s was a competitive race. So even with hundreds of thousands spent in a highly competitive race, it was tough to move the needle either way. Moraitis received about 200 more votes than Bogdanoff in those same precincts, despite Moraitis not having a very competitive race. Conversely, Sachs received about 1,000 more votes (not a huge difference) than the unknown Herman in the same precincts. The only race where there seemed to be any real change in voting patterns was the governor’s race. Rick Scott received about 4,300 less votes than Moraitis in these precincts. The Governor’s race was definitely the most competitive, receiving the most paid-for (over $100 million spent between the candidates) and earned media attention, so perhaps this shouldn’t be a surprise. Also, a third party candidate could have skewed the numbers in the Governor’s race a little. Outside of Scott underperforming the average Republican candidate, however, there was remarkable uniformity in what percentages the Republican candidates scored in Northeast Broward. Let’s compare Broward precincts that overlap each other in House District 93, State Senate 34, and County Commission District 4. The results in these precincts were Bogdanoff: 57.03%, Moraitis: 58.61% and LaMarca: 59.75%. LaMarca’s race was slightly more competitive than Moraitis’s race: while LaMarca showed about $350,000 in spending, the underfunded Democrat Ken Keechl spent about $30,000 on his campaign in the last month (not included any ECOs in these two numbers). Still, LaMarca had the most crossover votes in this portion of his district, doing about 1% better than Moraitis, which is admirable considering the more competitive nature of the race. Every precinct that LaMarca won is this portion of the district, Moraitis also won. Now, let’s analyze the portion of LaMarca’s district that is NOT in House District 93/State Senate 34. In these precincts, many of which have larger African American populations, LaMarca received only 27.9% of the vote. Let’s compare this to Adam Putnam’s percentage in those same precincts: Putnam received 27%. We have to use a statewide candidate to compare here, since neither Bogdanoff nor Moraitis ran in those precincts. Adam Putnam performed most similarly to Bogdanoff, Moraitis and LaMarca in the other precincts, so we are using his numbers here. (I’m not using Rick Scott numbers as a comparison, because Scott underperformed every other Republican here.) So LaMarca still had more crossover support in these precincts, outpacing Putnam by 0.9%. Still, it’s a remarkably uniform pattern where there is only a 0.9% difference. Mixing these much more Democrat-heavy precincts together with those in HD93/SD34, LaMarca ended up with about 53% of the vote. So, one might ask, how do these seats, which seem more competitive on paper, end up being such landslides for Republicans? NPA’s MUST BE “REPUBLICAN LEANING” IN NE BROWARD. Studies have shown that NPA voters typically side with the majority of voters surrounding them. Thus, Broward’s NPA voters in the more Republican East side of Broward will typically vote for the Republican candidate, while NPA voters in the rest of Broward will typically vote for the Democrat candidate. NPAs typically turn out in much lower numbers than Republicans or Democrats. Democrats and Republicans typically vote for their party’s nominee about 80% or more of the time. In close districts, which way the NPAs lean can be the difference. Northeast Broward, however, which typically gives outsized victories to the Republicans, seems to show that NPAs here must be siding with the Republican candidate. With Bogdanoff scoring 55.5% to Sach’s 44.5% in the Broward portion of SD34, which contains only a 2% Republican voter registration advantage, NPAs must be siding with the Republican candidate here. VOTER TURNOUT/PERFORMANCE IS KEY. Turnout in Broward as a whole was only 44.48%. But turnout in SD34/HD93 precincts was 51.41%. Turnout in the County Commission 4 districts that are NOT in SD34/HD93 was only 43.02%. So, it’s easy to see that the more Republican areas of Broward turned out much heavier. Voter performance is key to Republican victories here. Though we don’t have the breakdown of who voted by registration – those numbers are available yet – you can see that Republican voters turned out in higher percentages than Democrats here, leading to outsized victories compared to the registration numbers. In LaMarca’s County Commission district 4, while the simple registration numbers show an 8.4% advantage for the Democrats, when you look at how voters typically turn out (voter performance) in an off-year non presidential election, you will see that as a percentage of who shows up to vote, County Commission District 4 actually has a 1% Republican turnout advantage. (I am using turnout numbers available for these precincts from the 2006 and 2010 elections. As I said earlier, date for 2014 that breaks out party registration isn’t available yet.) Even if the non-SD34 precincts had exhibited a similar turnout to the SD34 precincts, it would still have titled the race towards LaMarca since County Commission District 4 contains a lot more voters within the SD34 precincts. Since this district only has its election in non-Presidential years, you can expect a similar turnout pattern and voter performance in the future. Democrats simply don’t tend to show up to vote in non-presidential years. 2006 was the rare exception – a wave Democrat year when Ken Keechl won this seat when it had a Republican registration advantage. Unless there’s another wave-Democrat off-year election in 2018, you can expect a Republican advantage in voter performance in County Commission District 4. This pattern is also visible in statewide races. Florida Democrats will show up in Presidential Years (2008,2012), but not in off-years (2010,2014). In some Florida state house districts, this pattern is clearly visible. State House District 63, in Tampa, swings wildly despite its 6,000 more Democrats voter registration advantage. With an election every two years, it recently elected a Democrat in 2012 and a Republican in 2014. It’s because Democrat voters will show up in a Presidential Year (2012), but voter performance turns this district to a Republican advantage in off-years. The takeaway is that the Democrat cannot simply rely on a registration advantage to win in County Commission District 4, because it’s voter performance that matters. LaMarca also deserves immense credit for outpacing other Republicans in these precincts, and running an excellent campaign focused on service to the district rather than partisanship. The takeaway: Liberal Broward County’s 2014 vote for the Republican candidate for Governor was less than 30% (the lowest countywide percentage for a Republican Gubernatorial candidate in Broward for available historical records), and Broward was the only county in the state where the raw vote total for Governor Scott was actually lower than he received in 2010. STATEWIDE. The election results have finally been certified. Governor Rick Scott officially won Florida with a margin of 64,145 votes. I, of course, was very pleased that Governor Scott was reelected. As I’ve done in the past, I’ll attempt to put all of these numbers in context, and compare them to past elections. I started by analyzing some Sarasota county election results here, here and here. Now, after some requests, I’ll begin with some Broward County election analysis before moving onto statewide trends. BROWARD BACKGROUNDER. First, let’s start with a little Broward County election history. (I grew up there.) Registered Republican numbered 236,069 voters, while Democrats numbered 545,119 as of the book closing date of the November 2014 election. As you can see, Broward county is a liberal bastion that Democratic candidates depend upon to deliver them votes. Typically, a Republican candidate had to pull about 35% of the vote in Broward in order to win the state of Florida. Governor Scott changed this dynamic back in 2010 when he won Florida while only receiving 33.35% of the vote in Broward. He did this with increased turnout from the northern, more Republican parts of Florida. 2010 was also a “Republican wave” year, where Democratic turnout was depressed compared to past election cycles. In Broward, total turnout was only 41% back in 2010. (This is turnout of all voters. Turnout by party is generally available from the Supervisor of elections about a month after the election. When turnout is low in heavily Democratic Broward County, that usually means Democrats didn’t turn out. In fact, Republicans in Broward had about a 49% turnout in 2010.) This year, total turnout was 44.48%, which means that Democratic turnout had to have increased compared to 2010. Broward has generally exhibited lower turnout in recent years (since 1998) compared to the state as a whole, which had a 50.51% turnout in 2014, and may be explained by reading the Decline of the Broward’s Midterm Voter. BROWARD VOTE TOTALS FOR SCOTT AND CRIST. In Broward, it was 138,394 votes for Scott and 318,950 votes for Crist. That’s a margin of 180,556 for Crist. As I mentioned, Broward county is a liberal bastion so it was a typically lopsided showing. In fact, it seems to be the worst showing for a Republican gubernatorial candidate as far back as the data is available. Going back to 1978 (as far as available on the state and local supervisor of elections, see graphic below), I couldn’t find any gubernatorial election where the Republican received less than 30% of the vote in Broward, but in this year’s election Scott only received 29.47% in Broward. Democrat Charlie Crist increased the Broward Democratic margin of victory by a whopping 49,395 votes better than Democrat Gubernatorial Candidate Alex Sink in 2010. Governor Scott had to overcome these deficits by adding some serious numbers from Duval, St. Johns, and Sumter, as well as ratcheting up his margins in many other smaller counties throughout the state. Crist performed far behind Sink in northern Florida, where he spent little time campaigning. Scott actually received 2,051 less raw votes in Broward County than he did in 2010. 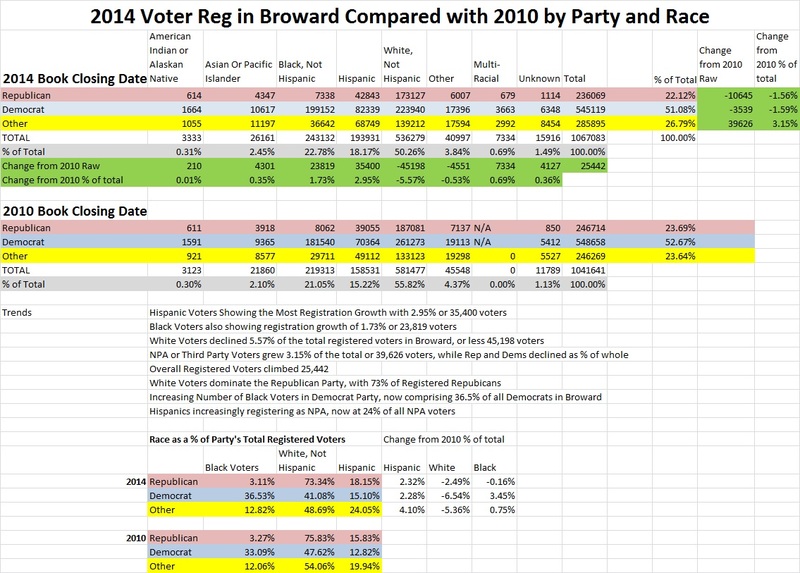 Broward was the only county in the state where the raw vote total for Scott was actually lower than in 2010. In future posts in this series, I’ll try to examine why the vote turned out like it did by reviewing turnout and voter performance, comparing the more Republican east side of Broward county to the rest of the county, analyzing demographic trends, and trying to draw some conclusions to explain the numbers. Florida Insider Poll: Who’s Likely to Run in the 2016 Senate Race?